California Pizza Kitchen is delicious – it also features an imaginative line of hearth-baked pizzas including the Original BBQ Chicken pizza, and a wide selection of distinctive pastas, soups, salads, sandwiches, desserts and more. Offering Dine-In, Take-Out, Catering and an Award-Winning CPKids Menu. 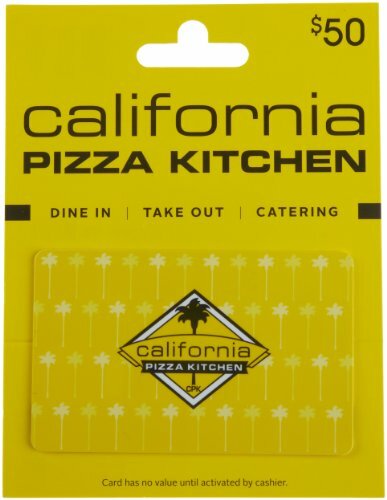 At $50 this is a great giftcard for a couple or family going out for a meal or for a friend who just can’t get enough CPK. Offering Dine-In, Take-Out, Catering and an Award-Winning CPKids Menu. 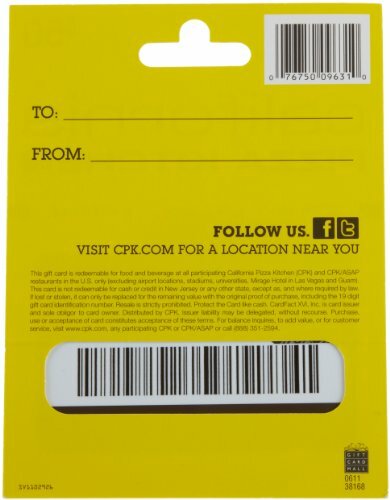 Redeemable for food and beverage at all participating California Pizza Kitchen (CPK) and CPK/ASAP restaurants in the U.S. only.